If you’ve ever owned a Volkswagen product, you’ll instantly understand the nostalgic appeal of this latest diesel powered Jetta. From its taut seats to its logical control array, to its bank vault fit and finish, this product distills years of VW tradition into a seductive new package that’s not only affordable ($25,545) and economical (42MPG/ highway), but fun to drive as well. Even the diesel engine rekindles VW nostalgia, since the very first Rabbit the company built and sold 35 years ago in the USA was available with diesel power. Having driven that Rabbit back in the late 1970s, I can testify that diesel technology has advanced from its Ice Age to its Golden Age. 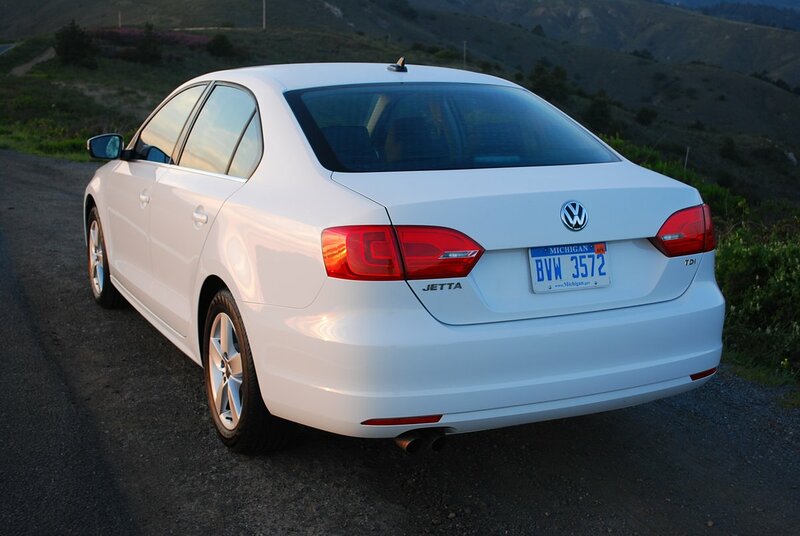 Although the Jetta’s current 2 liter, four cylinder diesel produces only 140hp, the real wallop comes in the torque department, where this TDI (“Turbocharged Diesel Injected”) power plant twists the front wheels to the tune of 236 lb.-ft. of thrust. You can look high and low in VW’s cupboard for another 4 cylinder engine that matches this diesel for torque. 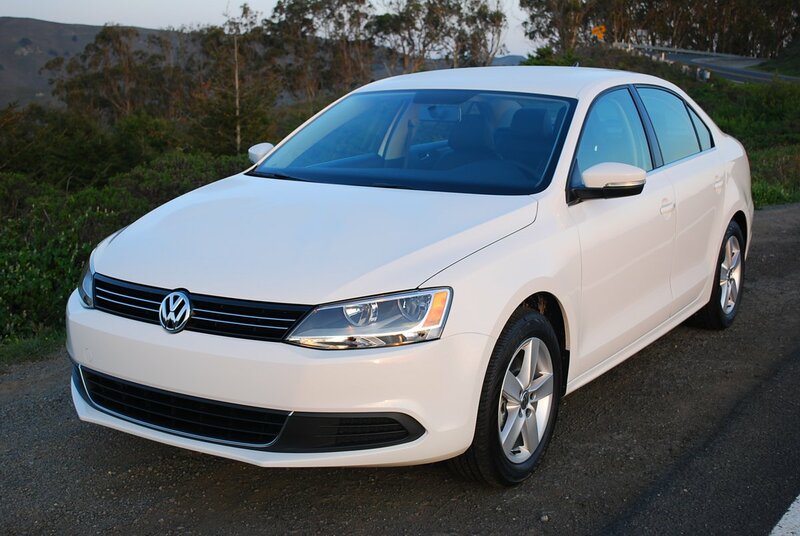 Even the vaunted GLI 2.0 liter turbo gas motor makes just 207 lb.-ft. of torque. The rest of the Jetta engine offerings don’t even come close to matching the diesel. For example, the base 2.0 liter gas motor makes just 125 lb.-ft., and the soon to be phased out 2.5 liter inline 5 cylinder gas motor, which is available only in the Sport Wagon this year, makes 177lb.-ft. of torque. In effect, this abundance of torque makes your job as a driver less demanding and more fun. You really need not worry about which gear ratio the DSG automatic 6-speed has selected, because there’s always enough grunt from the diesel to pick up the slack. Of course, if you enjoy stirring the pot on your own, DSG encourages you to do so by offering a manual gate that accommodates sporting override by the driver. No paddles on the steering wheel, however, and you need to remember that the diesel runs through its power band rather quickly and never needs to be wound past 4,000rpm. The long standing appeal of the Volkswagen family lies in the fact that no matter which model you choose, you can rest assured that the furniture in the living room will be arranged the same basic way. There’s a lot to be said for such predictability in layout, instrumentation and touch surfaces. Familiarity is a strong point that keeps long time VW owners coming back to update their Wolfsburg fix. For example, you can depend on the fact that VW will always offer easily grasped, knurled knobs to control such cockpit essentials as fan speed, temperature setting and vent positioning. You’ll never find this company resorting to the ineffectual slide type digitized controls that have proliferated in so many Japanese products today. VW has also been loath to jump on the bandwagon celebrating the advent of lane departure warnings and cross traffic alerts. Kudos to this company, which still feels that the driver should play the central role in the operation of the vehicle. Of course, there are a few shortcomings that the owner of a TDI will want to address. The first issue is this Jetta’s diminutive tire size. Though equipped with handsome 16 inch, 5-spoke alloy rims, the accompanying 205/50R16 Continental Sport Contact tires look grossly undersize on this vehicle. While these tires ride quietly and afford excellent comfort, their modest tread width limits the performance of the Jetta when tackling back roads aggressively. Remedy this problem by upgrading to wider tires mounted on 17 or 18 inch rims. 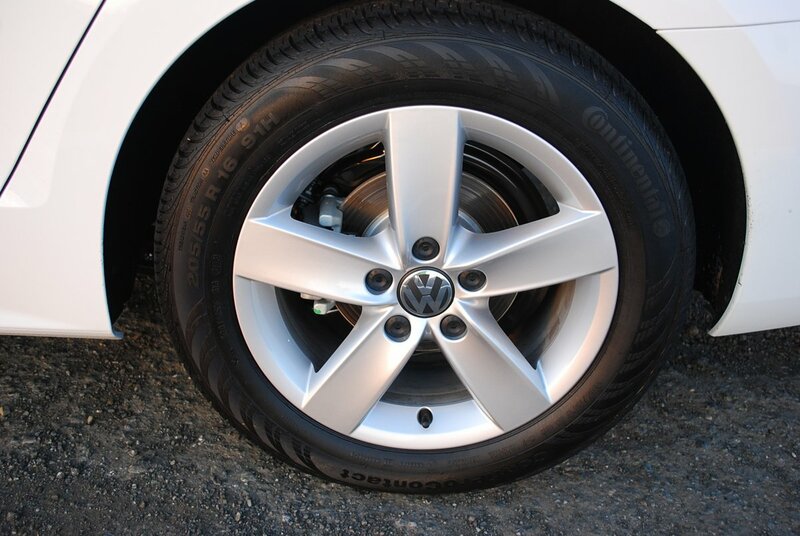 In fact VW offers 17 inch factory “Goal” alloys with 225/45R17 all season tires for $1,125 extra. Or you can bump up to 18 inch VW “Motorsport Alloy” rims and tires for $1,400. One thing this Jetta needs that is unavailable from the factory, however, is a rear window wiper to clear that flat, expansive pane of back glass when it rains or mists. But all in all, the short list of needs here is far outweighed by the many virtues of this efficient, affordable and handsome family sedan.